The LCD monitor with the response time of 25 ms can be used not only for office applications; it performs quite well in dynamic games as well. Images in speedy action games are just a little bit blurred. But technical characteristics of LCD monitors have recently reached a new level. The new monitors sport a record-breaking response time of 16 ms. How such characteristics influence image quality in applications which need a high refresh rate will be estimated with one of the monitors equipped with the latest-generation matrix (another similar model was tested a short while ago). 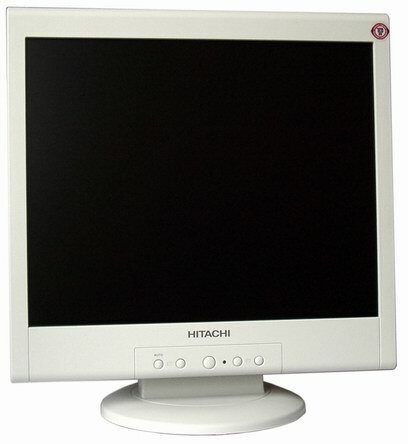 This is CML174SXW monitor from Hitachi. The monitor is packed into a compact box well prepared for transportation. The monitor comes with a user guide, drivers on CD, two VGA and DVI-D cables and a power supply cord. There are two PC connectors on the back: D-Sub and DVI-D. It's very good that the monitor comes with a DVI cable, because it's still a problem to find such cable at an acceptable price, and some vendors sell DVI LCD monitors without respective cables. The design is standard - such models are widely available on the market. They often have mini-speakers under the screen making a good office solution. With the standard base the portrait mode is lacking. The vertical tilt angle can be adjusted from +5° to -30°. The power supply unit is built-in, and the power supply connector is standard. Since the portrait mode is not supported the LCD panel is not that high (together with its base), and it's a good solution for PC desks with low shelves. I faced a similar problem when I tested Samsung 171P: it needed just two more centimeters off to get under the shelf. The control panel is located in the center under the screen. The controls are traditional (by the way, a similar control scheme is used almost in all Acer's models). Two left keys change parameters (one of them is also used for auto tuning in case of the analog connection). The right keys switch menu items. The menu offers standard functions: brightness, contrast, color temperature, sharpness, manual image adjustment. Note that a user is offered two modes for image correction. Sharpness can improve image & text quality in case of non-standard resolutions. Since the monitor comes with a DVI cable I decided to test its digital mode first. The monitor detected the DVI connection and set all necessary parameters. The default frequency is 60 Hz but you can raise it up to 75 Hz. The drivers boast of even 100 Hz, but actually you can't get it higher than 75 Hz. At fight sight, the image looks very sharp and contrast. It took me some time to adjust the tilt angle so that the gray color spread over the whole screen looked uniform. If you look directly at the monitor, at the same level, it will be needed to turn it back by 15-20° to avoid distortions and make the color look uniform. When the monitor switches from one mode to another it displays "No Singal", which actually irritates a little. In case of the DVI interface there are only two parameters that can be adjusted - brightness and sharpness. The brightness can be changed by 20%. The optimal value for home was 35. It's enough for day work and not much for night work. The black color in day light and intensive artificial light is very good, the backlight is almost ideally uniform. In the minimal night light the black screen has a dark blue tint; the glow is not very uniform, two small brighter stripes are noticeable above and below (probably, the backlight lamps are located there). You can change color temperature and correct colors only in the video card settings. Unfortunately, the contrast level is very high in case of the DVI connection, and color rendering suffers. The picture was quite poor after gradient filling with different colors. I had to correct colors to improve the image. Nevertheless, the image was still too contrast, and it wasn't s not very comfortable to watch movies. So, the DVI interface is more advanced but in this monitor it underperforms. Further tests were carried out with the analog interface. When I connected the LCD panel to PC via VGA I had to use the auto tuning right away because the monitor incorrectly detected the video mode set in the BIOS. When the Windows finished booting the auto tuning was repeated. It worked well and ensured a high-quality image. It looked like a completely different monitor. Even with the default settings the color rendering was absolutely different. I applied gradient fill and noticed no traces of what I could see at the DVI connection. The color rendering became much better and needed just a little correction, though it it's quite subjective. Although you can be faced with problems of adjusting some parameters, I had none during the tests. Also, a user is offered all settings available in the monitor's screen menu in case of the VGA connection. When I solved the problem of color rendering I decided to find out what other problems can occur. First I took a look at the viewing angles. In general, they coincide with the specs, but certain color aberrations are noticeable at 40 degrees and over for horizontal angles, though image quality is generally good. From above the white color goes negative at 30-35 degrees. If you look from below its will be 40 degrees and over. It's not a bad disadvantage because people are used to look at the screen a bit from below (now I understand why monitors with such matrix do not support the portrait mode). After that I ran PassMark Monitor Test and Check Screen. The results are typical for an LCD display supporting 262K colors. When I compared tails of quickly moving geometrical figures with my Samsung 151B I noticed a real difference. While the figures left a prominent white tail on the Samsung 151B, they had almost nothing behind them on the Hitachi 174. In World, Excel all the symbols were clear. The fonts were a bit too small, but it's typical for all 17" monitors: their bigger brothers (18" or 19") make standard fonts look more comfortable. I dragged windows with tables and noticed nothing suspicious. Then I surfed the Internet: the IE looked excellent. The image was very good, clear and rich. Maybe color rendering wasn't very precise but I liked the colors. Just do not use the DVI connection :) There was an interesting peculiarity when I scrolled the text. If the text color is gray or about that, it looks like some pixels drop out during scrolling. But it doesn't irritate or affect the image, - it's just an interesting fact. For the tests I used exceptionally DVD movies. Even high-quality DivX movies at a good bit rate are not able to deliver dynamic scenes well, while quality of such scenes is to be tested in the first place. I ran two movies: "007: Die Another Day" and "Gone in 60 Seconds" and noticed no artifacts like blurred scenes or tails. The colors are rich and natural, the image is very sharp. The wide viewing angles let you comfortably watch movies lying on the sofa. Here I compared it with my Samsung 151B. The image quality in this type of games is excellent. When the monitor uses the VGA connection, all minor details in even dark areas are distinct. You don't have to adjust contrast and brightness. In case of the digital interface enemies can easily hide in the shadow as all black gradations merge into one hue. All games were run in 1280x1024, though other resolutions were also tried. Scaling worked well. I tried 1024x768 and 800x600, and it didn't differ much. Switching on/off the anti-aliasing mode brought no considerable distortions. But the images got a little soapy in lower resolutions though you still can play comfortably. When I played on my Samsung 151B, the lag effect was sometimes noticeable, in particular, it made fonts small and caused delay in image rendering. I didn't bother much and quickly got used to such game reality. But when I started the game on Hitachi CML174SXW I felt how close the new matrix was to a CRT monitor. No artifacts remained, though the monsters got a little blurry when they moved really fast. Actually, I haven't seen an LCD monitor before which could make playing a dynamic game such a pleasure. Action/RPG games are not so dependent on speed as Action/FPS, but various distortions are also possible when heroes or the camera move fast. If you quickly rotate the camera on the Samsung 151B the surrounding world will lose its sharpness. On the Hitachi CML174SXW such effect is much weaker. In the resolutions different from the default one - 1024x768 and 800x600, no problems occur with interpolation. But 800x600 looks more soapy than 1024x768. This is an excellent monitor for gamers. Certainly, it can be perfectly used in offices, but the matrix with such a low response time is just created for comfortable playing active games. Even hard-core gamers who looked down on LCD monitors before will be satisfied with the image quality. Of course, there are downsides, and the worst one is poor color rendering in case of the DVI interface. But the VGA interface makes up for it.